Anyone for croquet on Heath? THE Marx Brothers and film director Howard Hawks held special parties for it, and Tolstoy had a court in his back garden, but it’s safe to say croquet has never been the sport of the masses. 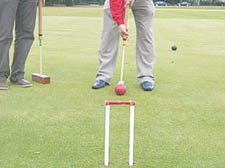 Hampstead Heath bosses are considering locations for the first public croquet lawn in London, with balls and mallets for hire by anyone who wants to play. The City of London, managers of the Heath, has revealed plans to bring the traditional summer garden sport, long considered a favourite with the landed gentry, military officers and vicars, to the park this summer. While the move has delighted croquet aficionados, there may be other hoops to jump through before everyone is won over. Klim Seabright, secretary of The Croquet Association, welcomed the news. “It’s in line with a steady growth we’ve been experiencing in the past two or three years,” he said. But he expressed concern about lawn care. “Before you allow a stranger on your lawn you want to know they’d respect it,” he said. Mr Seabright is keen to dispel what he considers the myths surrounding the sport, for which Great Britain currently holds the world championship title. Paul Maskell, leisure and event manager for Hampstead Heath, said there was “nothing set in stone at the moment but a lot of interest”. Locations across the Heath are being considered.